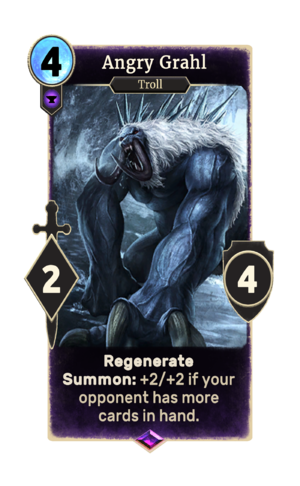 Angry Grahl is an epic Endurance creature card. It is part of the Core Set. In addition to the card's availability in the Core Set, one copy is obtained for completing Tangled Web. This card was previously part of the training mechanic where it could be upgraded from Cave Grahl at level 46. This card's summon ability applies the Grahl Angry! card effect. This page was last modified on 14 February 2019, at 11:49.